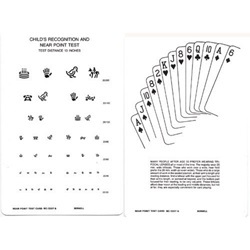 Double-sided English acuity near testing card with Allen figures on one side and playing cards on the other. 20/30 to 20/200 acuity measurements. Hold 13" away. Measures 5.5" x 8". Manufactured by Bernell. Comes as singles.